A compulsively simple word game a bit like Scrabble. The special 30-sided alphabet dice is rolled to reveal various letters of the alphabet, which players use to try to make words of up to nine letters. But do think carefully, if you can't finish a word, you score zero !! A great fun word game. 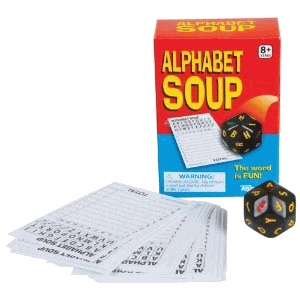 Words are built strategically one letter at a time, and part of the game challenge is trying to choose the best position to write each letter on the score sheet before the word has taken shape. The aim is to get the most points with the longest, highest-scoring words. Plenty of score sheets are included for lots of games. For one or more players. Suitable for ages about 8 and up. A great game, and also fine for a travel game. Only £1.90, click to BUY now from our online store !! and certainly within 3 business days. 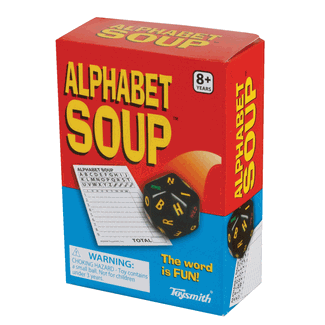 "Myself and my young daughter happily play this Alphabet Soup every day." "My young son beats me at this sometimes, but I'm not bad at it ! "